File Types: JPG, EPS, All Files; File Size: 5.01 MB; Requirements: Adobe CS1+; DPI: 300 DPI; Vector: Yes. Vector illustration with plate of pasta. Zip file contains fully editable EPS10 vector file and high resolution RGB Jpeg image(6000x7429). 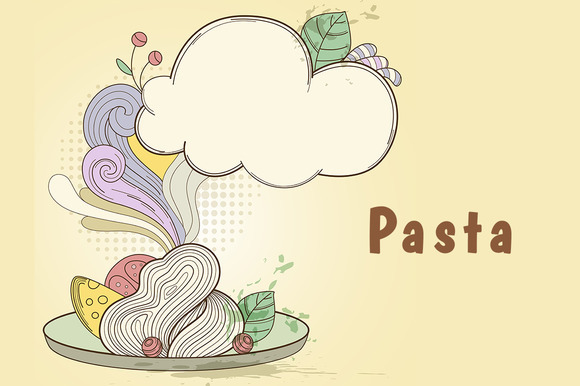 Keywords: pasta, food, spaghetti, plate, dish, cheese, tomato, menu, cloud, steam, vector, italian, tasty, restaurant, banner, background, retro, hot, design, cooking..
Best ddsign template, vectors, illustrations, video templates from creative professional designers with After Effect, PhotoShop, 3DS Max, Cinema 4D or InDesign. Full details of CreativeMarket Pasta in a dish 459361 for digital design and education. CreativeMarket Pasta in a dish 459361 desigen style information or anything related.